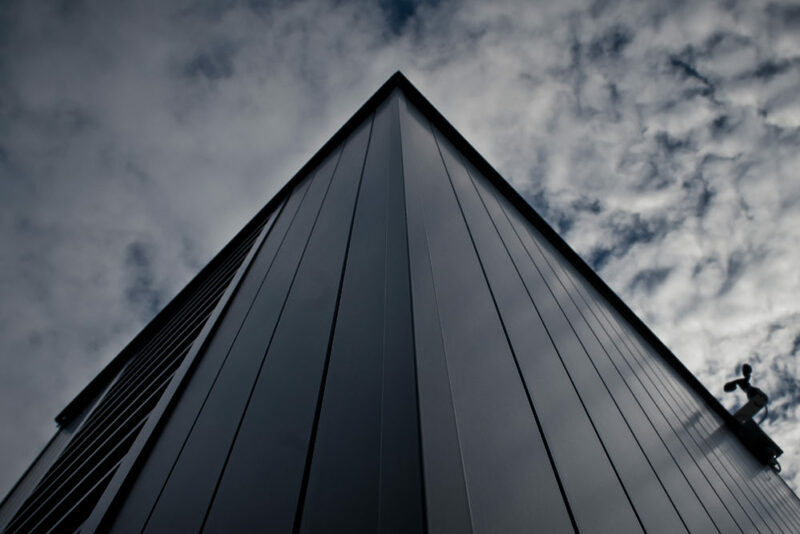 The SPA templates (one of which we’ll be using in this post) require .NET Core SDK version 1.0.1 or above and node.js to be installed and set up on you development machine. I’d recommend that you have both of these installed before you continue reading this article. Especially if you’re going to be coding along with it. The latest version of node.js can be downloaded from the official website and the latest version of the .NET Core SDK is available from the official website for it, too. 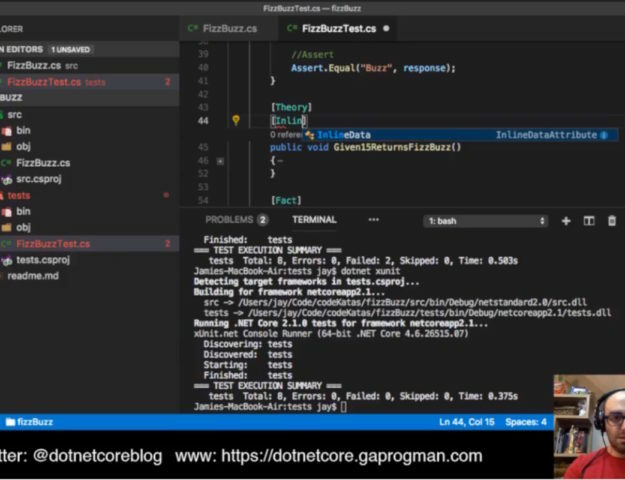 In a recent post, I introduced the topic of .NET Core 1.0.1’s templating engine. 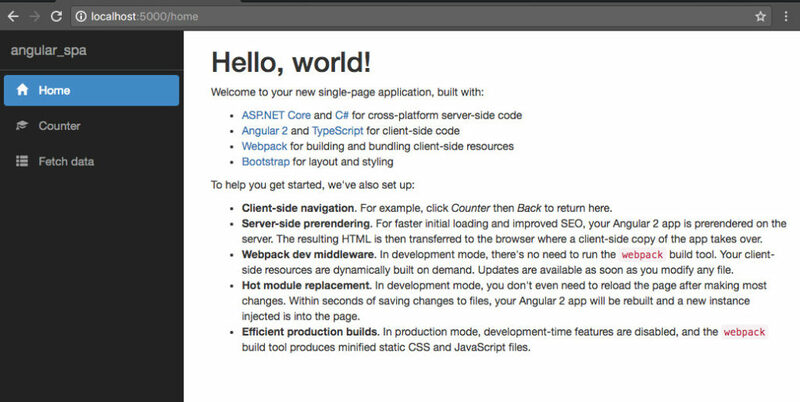 Today, we’re going to take a look at the Angular2 single application template provided by Microsoft. Angular2 is the second iteration of the main Angular project, with Angular4 being the next version. Creating projects from these templates is not yet supported in any of the Visual Studio IDEs. Template Instantiation Commands for .NET Core CLI. template The template to instantiate. -l|--list List templates containing the specified name. -n|--name The name for the output being created. If no name is specified, the name of the current directory is used. -o|--output Location to place the generated output. -h|--help Displays help for this command. dotnet new -all | findstr /I "angular"
And they will be installed. Restoring the Node packages will take longer than the .NET Core packages, as there are quite a lot of Node packages to pull down. If you take a look at the directory structure again, you’ll notice a new directory is listed: node_modules. It can do a lot more than just that, but we’ll stick with this explanation for now. we told node to use npm (node package manager) to take a look through the package.json file and install all of the node packages it found there. The ‘-d’ switch told npm to install them locally (in the directory where our packages.json file is located), rather than in the system wide cache of packages. Installing node packages locall is the default action for npm. There are many reasons for this, the main one being that we might have two different projects which rely on different versions of the same node packages. If so, which do we store in the system wide package cache? It makes more sense to store the specific packages relating to a given project in the development directory for that project. To learn more about node.js, I would recommend taking a look through Learn You Node. And if you head to the URL that .NET Core gives you (mine was localhost:5000), you should see something very similar to this. From the rest of this article, I’ll be using Visual Studio for Mac. Aside from the size of the text and the file type icons used, VS Code shows all of the sub-directories within our project whereas VS for Mac hides the bin, obj and node-modules directories. Just something that might be worth noting, going forward. Personally, I prefer the way that VS Code displays things. 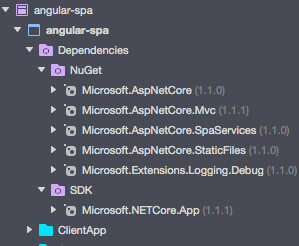 Taking a look at our directory structure, at the top are our NuGet and SDK dependencies. 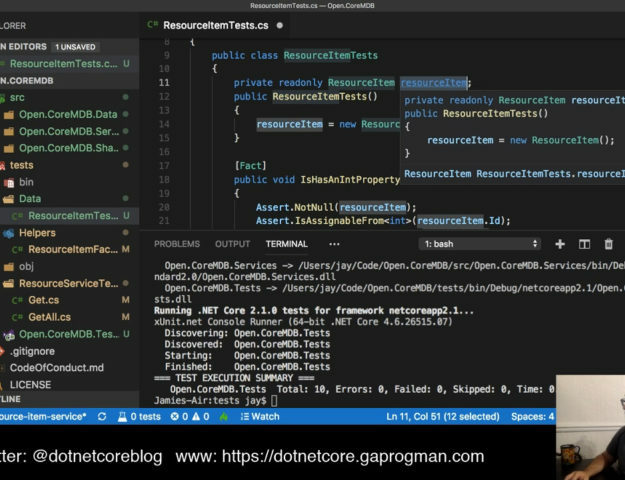 The first two NuGet dependencies (AspNetCore and AspNetCore.Mvc) and the single SDK one (.NETCore.App) are for .NET Core and .NET Core’s MVC frameworks. AspNetCore.StaticFiles allows us to serve static files from our wwwroot directory. Extensions.Logging.Debug is used for logging purposes. Server-side prerendering is an amazing feature. When I wrote about bundling a while back, I’d talked a little about how browsers work. I’d mentioned that everything required to render a page (the markup, CSS, JS, images, etc.) has to be downloaded before a page can be rendered by the browser. The browser will have to wait until those downloads are finished before rendering the page (unless you do some smart things with lazy loading) and showing it to the user. This is where server-side rendering comes in. The basic version is that .NET Core will run the Angular or React+Redux code on the server, after creating the HTML response. This has the double whammy of producing HTML with all of the initial Angular or React+Redux components built into and part of the rendered HTML. Meaning that the user doesn’t have to wait for the bundled JS to download and for Angualr or React to inject the relevant components for the selected view. 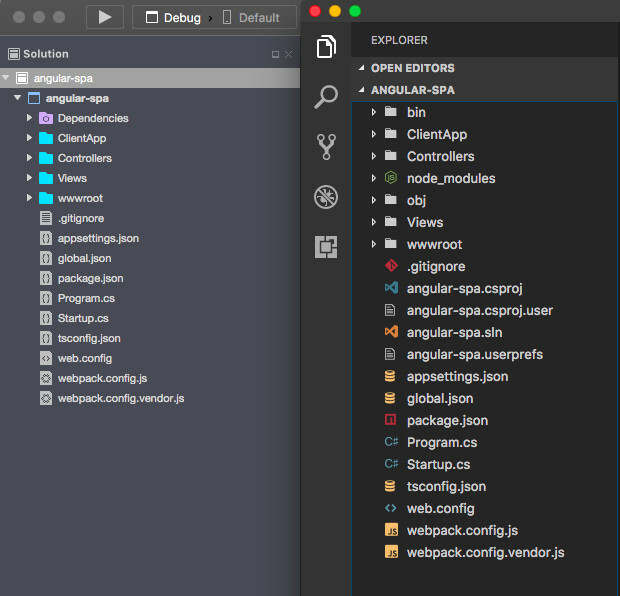 Each of the SPA templates uses webpack to package all of the dependencies for your application. Webpack dev middleware is integrated into these projects via SpaServices. As long as your application is running in the Development environment, you can modify your client-side code (e.g., the TypeScript, or in Angular, the html files that are compiled into your components), and the updated version is almost immediately available to the browser. You don’t have to run any build commands manually. So each time that you write a change to any of the client side code to disk, webpack steps in and rebundles everything for you. This is the most impressive step of the bunch and builds on the webpack middleware. With Hot Module Replacement enabled, the webpack middleware is given a direct line of communication to the local browser you are using to test your development code on. As you make changes, and the webpack middleware bundles those changes for you, the new versions of those bundles are pushed to the local browser and the new code is injected directly into your session WITHOUT causing a page refresh – meaning that your state is kept between changes and rebundle actions. It’s worth taking a really quick look in the views directory to get a sense of what has changed recently, and some of the new tag helpers. are being served as static files from the wwwroot directory. Just how I said we would use them earlier. and is what is used to render the JS on the server before injecting it into the response. The ClientApp directory is where all of the client side Angular code that we will create and edit is located. We’ll skip over the dist and test directories and take a look at how the Angular modules are brought together. Each of these groups of files are Angular specific components. Let’s take a look at one, before we take a look at the app.module.ts file. We’ll take a look at the home component as it’s the simplest of the components. The first thing that we’re doing is importing the core Angular code. This will expose all of the core Angular functions and interfaces. The import keyword (when used with webpack) works in a similar way to how the require keyword works with requireJs. This includes setting up an Angular routing selector, and the template HTML. When the home route is selected, Angular will find the component which matches (we’ll see how the routing works in a moment), will render the template HTML and inject the TypeScript classes that are included in the component (in this case the HomeComponent class). Then we define an empty TypeScript class called HomeComponent (which contains our component). Each of the components is added to the app-module.ts file via import commands (which are picked up by webpack). @NgModule takes a metadata object that tells Angular how to compile and launch the application. imports — the BrowserModule that this and every application needs to run in a browser. bootstrap — the root component that Angular creates and inserts into the index.html host web page. We’re then declaring all of our components and our imports (which takes our components and registers the routing for them. This is a little similar to .NET Core’s MVC routing, except that it is more explicit as to which components are used for the routes supplied. For example, the highlighted line in the above code block ensures that the route ‘home’ loads the HomeComponent. Unlike MVC’s routing, single components can be used in multiple routes. MVC’s controllers can respond to multiple different routes, using the Route attribute. But this is not an accepted practise and can lead to confusing code. Which brings us to the App Component. This is the component that we’re bootstrapping with Angular. Bootstrapping in this context means that Angular will take the components listed (the bootstrap object takes an array of components) and insert it into the DOM for the index.html at boot. 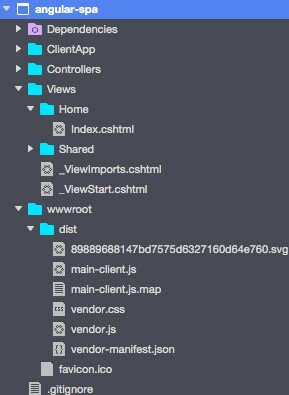 While you can put more than one component tree on a host web page, that’s not typical. Most applications have only one component tree and they bootstrap a single root component. You can call the one root component anything you want but most developers call it AppComponent. router-outlet is similar to the @RenderBody helper in C# – it is swapped out by Angular, replacing it with the rendered HTML template content of the selected component. Looking at the highlighted line shows us that the navmenu component uses a selector. The bootstrapping process sets up the execution environment, digs the root AppComponentout of the module’s bootstrap array, creates an instance of the component and inserts it within the element tag identified by the component’s selector. This means that Bootstrapper inserts the contents of the navmenu component into the DOM wherever it finds the nav-menu selector. Which is extremely handy if you want to add static looking (but dynamically created) content into the DOM. The routerLink directive takes an array of route names and a collection of query parameters, and these are parsed into full href tags. The routerLinkActive directive is used to apply a class (or a number of classes) to an element when the page URL matches that of the routerLink URL. 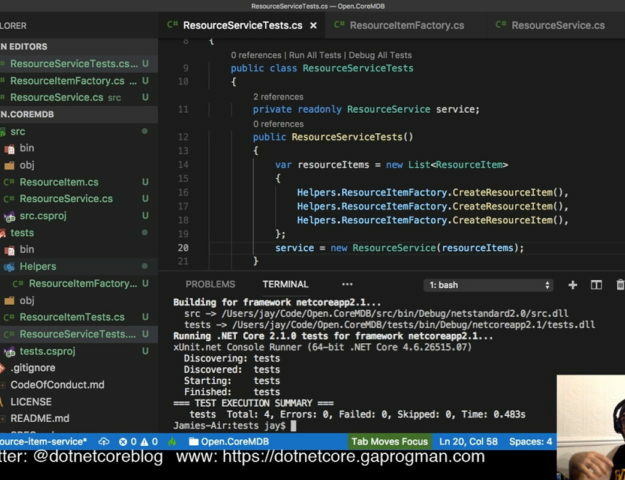 In this post we’ve created an Angular2 Single Page Application from the suite of .NET Core SPA templates and done a deep dive into how .NET Core and Angular2 work together to make this template useful. Have you built anything with the Angular2 template yet? In next week’s post, I’m going to be walking through how I made a UI for the webApi project that I made in the webapi-tutorial series.